As you may remember, when Steve resigned as middle school principal this summer, one of the first things we wanted to do with our more flexible schedule was spend some quality time with our parents. 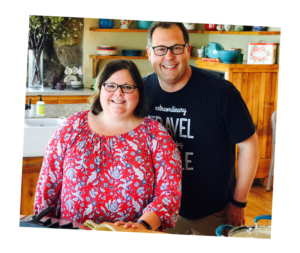 We took his mom and dad on a week-long trip across Nebraska in July and this month, we’re traveling with my mom, Carol, to the Pacific Northwest. Steve and I have never been to this part of the county (not for more than a few hours, anyway) and we’re excited to see the trees and mountains, drive along the coastline, and visit Pinot Noir wine country. Oh, and our beloved Nebraska Cornhusker football team is scheduled to play the Oregon Ducks on Saturday in Eugene. Sadly for many, several states on the west coast of the U.S. are battling forest fires after an unusually dry summer. 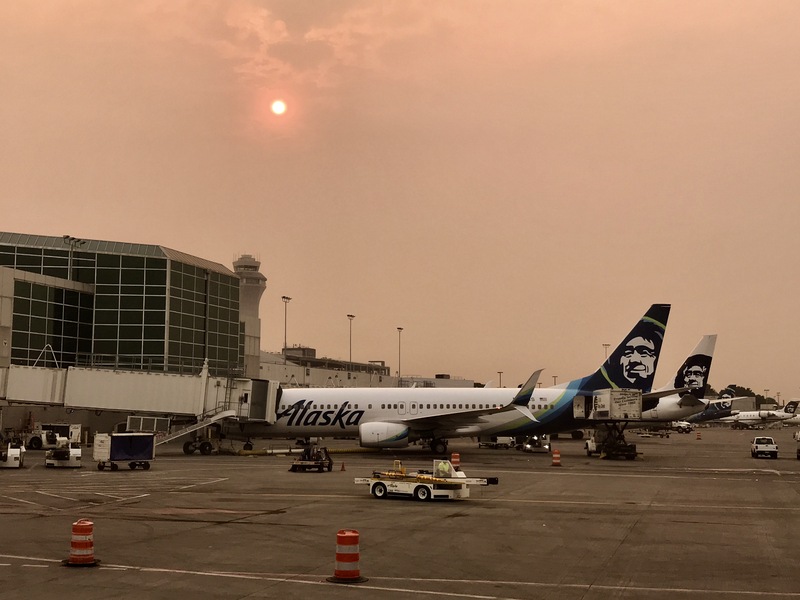 When we arrived in Portland yesterday, the sky was an orange/pink color and we could actually see and feel ashes falling from the sky. Alaska Airlines flight into Portland, Oregon. We are headed to the coastline for the first few days of our trip and hopefully away from the worst of the smoke. We’ll continue to pray for rain and the for the fires to be controlled to minimize the loss of life and property. Natural disasters like this are so sad to see. Especially in such a beautiful place. Welcome to Oregon! I’m sorry your here during the fires. So sad to see our beautiful state burn. I wish you could have seen the beauty of the Columbia Gorge before it was gone. The Oregon coast is beautiful also. Hopefully the smoke doesn’t find you there. I wouldn’t be surprised if it did though. Stop by Cannon Beach, walk the easy trail to Short Sands (Oswald Park) watch the surfers. Hug Point is another beautiful beach. Eat at Wanda’s in Nehalem fir breakfast. Stop in Wheeler at the antique mall. Stop at Tillamook Cheese factory and Blue Heron in Tillamook. Lincoln City is touristy but great bargains at the outlet mall. In Newport go to Nye beach for good food and cute shops. The Newport aquarium is nice but over priced. If you have time to go farther south Florence has the best Sand dunes. Crazy big. Sand buggies can be rented or relax and let them drive you. Lots of fun. I can go on and on. So much to do at the coast. Enjoy our beautiful state and come back again. We have the coast, desert and mountains. All within an easy drive. You would love Bend in Central Oregon especially. Take care and enjoy. Thanks for the great suggestions, Kim! We loved the Tillamook Cheese factory, and Cannon Beach! We also stopped in Depoe Bay and were able to watch some whales from the road side! Quite a day! You’re right…there is so much to see and do here, it is almost overwhelming. Thankfully, the smoke hasn’t been too bad along the coast. That’s awesome. Have a great trip! Love your blog by the way. Going to Cannon Beach? It’s one of our favorite destinations! We stopped yesterday. What a great town! Have a great time and I do enjoy all the pictures. Heading to the Smoky Mountains Sunday will send you a postcard. Thanks, and we’ll look forward to seeing the postcard! Of course go to Seaside the end of the Lewis and Clark trail Turnaround on Broadway and salt water taffey in Seaside. Now visit Cannon Beach and the famous Haystack rock eat at Tolovana Inn Mo’s clam chowder 3400 S. Hemlock st Cannon beach 5034362211 Have fun! Thanks for the suggestions! Cannon Beach was great, and we also liked the Seaside area! Welcome to Portland! Yes the Eagle creek fire is heart breaking ! Hwy 84 is shut down so the coast is the best place to be. Enjoy your visit along Hwy 101 to Seaside the end of the Lewis and Clark trail! Please post some pictures your visit!! Thanks, Kathy! Do you have any recommendations for places to stop between Astoria and Newport?